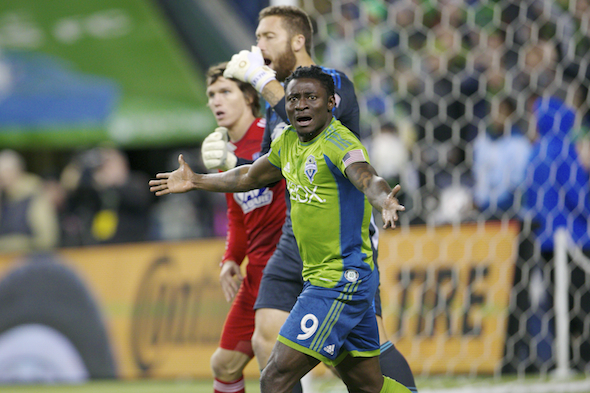 The Sounders were as stunned as everyone else when China came calling for Obafemi Martins. But GM Garth Lagerwey said there’s now roster flexibility and at least $2 million coming in a transfer fee. It wasn’t as if the Sounders were publicly pantsed. But almost. The abrupt departure of star forward Obafemi Martins for a team in China — deal’s not done, but Martins has tweeted his good-bye to Seattle — stunned most fans and delighted opponents, most of whom regarded Martins and Clint Dempsey as the most difficult MLS tandem to defend. Then again, imagine if Seahawks QB Russell Wilson could double his salary, after his prime had passed, by joining a fledgling league offering American football in Europe? And the Seahawks were reimbursed for their cost to get him from his original team? Well, you’re right — nobody in Seattle would get that, either. But that’s how it works in a global sport governed by an organization nearly as corrupt as Pol Pot was in Cambodia. No, FIFA wasn’t involved in any shenanigans with the Martins transfer. But when it comes to China’s international behavior, there is not much anyone can do, even though China is no more a powerhouse in soccer than Egypt is at the Winter Olympics. As with almost everything else in contemporary life, China believes it can throw money at the gap and fill it quickly. You know, like Yankees owner George Steinbrenner in the 1980s and 1990s. “Soccer is different than our traditional sports,” said Sounders general manager Garth Lagerwey with a shrug. “There are other leagues outside the U.S. that can bid for our players. He shrugged again. He did a fair amount of shrugging during an interview after the Sounders media luncheon Monday, ahead of the Sounders opener at 7 p.m. Tuesday against Mexican power Club America at the Clink. Lagerway admitted the club didn’t see this deal coming. “With some of our high-profile guys, there are rumors every week,” he said. “When it gets to the point when (bidding clubs) call me, then I start to worry. Even now, honestly, with the transfer announced a week ago, the deal still is not done. But when reports surfaced that Martins, at 31, would more than double his $3.6 million salary with the Sounders — the Washington Post reported Monday that he will collect $6.6 million in China after taxes — Lagerwey helped himself off the floor, shook his head and began to think it through. The Chinese Super League had been offering exorbitant salaries to stars from other countries as well, and Martins’ soccer passport had been stamped into tatters since he left his native Nigeria at age 15. The team in Shanghai would be his ninth, in eight countries. “Oba wanted to go to China — he’s going to make a good living doing that,” Lagerwey said. “I’m hard-pressed to argue with that. We’ve been able to re-do his contract a couple of times. But this got to the point where it didn’t make sense. The Chinese team reportedly agreed to pay a transfer fee of $2 million. While Lagerway didn’t confirm a number, he did say the amount was smaller than the reported $3 million fee the Sounders paid to get him in 2012. But not by much. “I wasn’t here when Oba was acquired, but I’m willing to make a bet (ownership) never thought they’d be able to sell him,” he said. “When you bring players (to the U.S.) in their late 20s, usually they’re not moving again for a transfer fee. Well, that’s fine if you’re an accountant. What about the facts that he was faster and quicker than almost anyone in MLS, a wizard with the ball, the Sounders’ leading scorer in 2015 despite playing only 21 games and the runnerup in the voting for MVP in 2014? And what about the cartwheel-roundoff-backflips, fercripesakes? “The timing isn’t ideal, and we will miss the goals, the excitement and the talent he brought,” Lagerway said, adding a sigh to the shrug. “But if we get the talent and tactics right, we can overcome this. Not to put too much pressure on the 21-year-old rookie from Stanford and Mercer Island, but the entire soccer community in Seattle and much of the national community on FOX Sports 1 will be watching every move he makes Tuesday in first leg of the CONCACAF Champions League knockout round. Instead of a gradual introduction to pro soccer, Morris, one of the most heralded home-growns in U.S. soccer history, is being thrown into the starting lineup in his first game. In the place of Martin, next to Dempsey up top. But before any pretense to a fairy-tale start for the local kid with the local pro team, there was a moment for a farewell for Martins, one of the most electric athletes in Seattle sports history. “Everybody has the right to choose their own path in their career,” said Dempsey after practice. “I have a lot of respect for Oba. He’s come from a little kid in Nigeria to playing with some of the best clubs in the world. He’s had a great career. In honor of Martins’ contributions, we should all do a backflip. You first. This is actually the standard practice in soccer, selling and buying players who are still under contract. Since player-for-player trades are virtually unheard of in world soccer, Team A will offer to buy the contract of a Team B player. If B agrees, the teams hammer out a purchase fee, and the player and Team A negotiate salary terms (say, $75,000 a week plus win and goal bonuses). Sometimes the player leaves immediately, sometimes he even finishes the season with the current club. More often than not, teams agree to sell their players for the profit motive. If you bought a player for $1 million and can flip him for $4, you take that profit regardless if he’s your difference maker., and use the cash for more or cheaper players. It may drive fans, teammates and coaches bananas, but the business side rules, especially if the team is in the red. The difference here is the transfer window. FIFA has established just two periods per calendar year where you can transfer players, otherwise your roster is set. If this new Chinese league is complying with that, I don’t know. ❝my .friend’s mate Is getting 98$. HOURLY. on the internet.”….two days ago new McLaren. F1 bought after earning 18,512$,,,this was my previous month’s paycheck ,and-a little over, 17k$ Last month ..3-5 h/r of work a day ..with extra open doors & weekly. paychecks.. it’s realy the easiest work I have ever Do.. I Joined This 7 months ago and now making over 87$p/h.Learn. More right Here:;/108➤➤➤➤➤ http://GlobalSuperEmploymentVacanciesReportsJobs/GetPaid/98$hourly…. .❦2:❦2:❦2:❦2:❦2:❦2:❦2:❦2:❦2:❦2:❦2:❦2:❦2:❦2:❦2:❦2:❦2:❦2:❦2:❦2:❦2:❦2:❦2:❦2:❦2:❦2:❦2:❦2:::::;/108……..
As to the Chinese league honoring the transfer windows? I know which way I’d bet. Well, the Sounders weren’t in a mood to complain. Understood about the transfer windows. The difference here is that China’s league season aligns with MLS, not the rest of the world. And not until the previous season did China start throwing big cash at international players. Which is curious timing, since China’s economy is in its worst slump in recent memory. concacaf is that org that had that cool guy from trinidad & tobago as its president, right? jack warner. allegedly took cash intended for haiti earthquake victims. classy. ❝my .friend’s mate Is getting 98$. HOURLY. on the internet.”….two days ago new McLaren. F1 bought after earning 18,512$,,,this was my previous month’s paycheck ,and-a little over, 17k$ Last month ..3-5 h/r of work a day ..with extra open doors & weekly. paychecks.. it’s realy the easiest work I have ever Do.. I Joined This 7 months ago and now making over 87$, p/h.Learn. More right Here:;/316➤➤➤➤➤ http://GlobalSuperEmploymentVacanciesReportsJobs/GetPaid/98$hourly…. .❦2:❦2:❦2:❦2:❦2:❦2:❦2:❦2:❦2:❦2:❦2:❦2:❦2:❦2:❦2:❦2:❦2:❦2:❦2:❦2:❦2:❦2:❦2:❦2:❦2:❦2:❦2:❦2:::::;/316………. Still have some misgivings about Oba moving on because he and Dempsey played so well together. Oba has been the Beastmode of the Sounders but like Marshawn Lynch he’s on the wrong side of 30 and has shown to be mortal at times. With Jordan Morris waiting in the wings now was the time to move him but I’m wondering if this season the club takes something of a step back in its development.